The existing metal roof system at the Davis-Monthan Air Force Base in Tucson had previously been coated with other popular roof coatings and required constant maintenance. This metal roof on the base was previously coated with a reflective acrylic system in some areas and a sprayed polyurethane foam system in others. The acrylic coating required constant maintenance to prevent the spray foam underneath from turning into a sponge. Acrylic coatings are permeable and allow moisture to pass through, which can lead to eventual rusting of the metal it’s supposed to protect. Other problems had been caused by continual movement of the metal, which is to be expected. Rather than continue to chase leaks and spend money on constant maintenance, the U.S. Air Force’s team of engineers and designers considered their options. Tearing off the entire roof and replacing it would not only be expensive, but very disruptive to base operations. Recovering the metal with a mechanically-attached single-ply membrane was an option, but drilling thousands of fasteners into the metal was a concern. 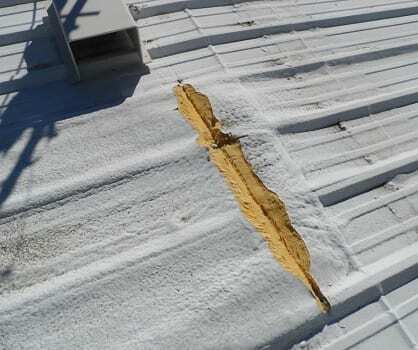 Not only does this create the possibility for moisture migration, but those fasteners reduce the energy efficiency of the roof by creating a thermal bridge. The other option was to install a spray application of TRITOflex seamless rubber directly over top of the existing coating and metal at 80 mils, creating a monolithic waterproofing membrane over the entire roof. TRITOflex is a water-based, zero VOC, and is part of an environmentally-friendly system. With extremely high elongation of 1,900%, the ability to withstand ponding water indefinitely as an impermeable membrane, and excellent durability, the only preparation needed was a simple pressure wash. Additionally, the TRITOflex system will hold up to the environment of an Air Force Base located in the desert, including jet fuel exhaust, dust storms, extreme heat, and an occasional hail storm. The Air Force Base chose the Triton solution and not only saved money compared with their other options, but preserved the high R-value obtained by installing polyurethane foam in the first place and avoided wasting that investment. 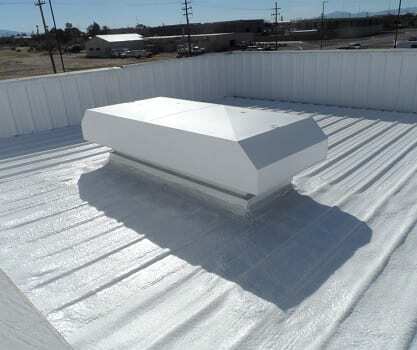 The Certified Triton Applicator completed the system with the TRITOtherm ceramic top coat for additional energy efficiency and protection in the desert sun, even when the roof becomes dirty over time. The U.S. Air Force made the right decision to invest in a watertight, flexible, and durable monolithic membrane that will withstand movements of the metal underneath and is guaranteed with a 15-year material and labor warranty, with extensions up to 35 years.